I have finished my block for the Leduc Guild Tin Box Exchange for this month. Our meeting is on Wed night were I will exchange my box for the next one. This is only round 2 out of 6. Our Tin boxes are 9 inches and our blocks are to be no larger than 8 and a half inches. 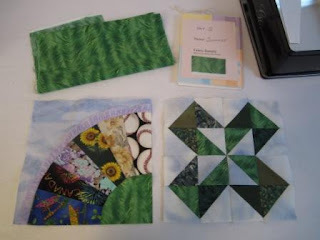 This is Box 2 and it has a theme of Spring and we were given the green fabric to use in the block. I found this block first on Amy`s Blog. But it is a pattern from Bonnie Hunter at Quiltville and was pictured Here. Thanks Amy and Bonnie for block idea. The block name is Jack in the Box. Ha Ha I did a block for the box named Jack in the Box. The half square triangles are finished to 2 inches, so my block will finish up at 8 inches. 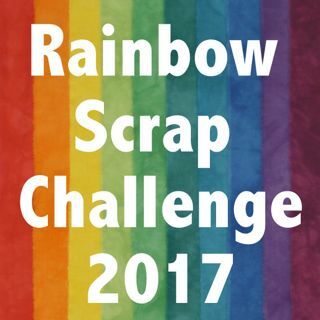 I was very good and went to my green scraps to get the other green fabrics, in the spirit of the Rainbow Scrap Challenge for 2012. The block on the left, the Fan, was completed by someone else last month. 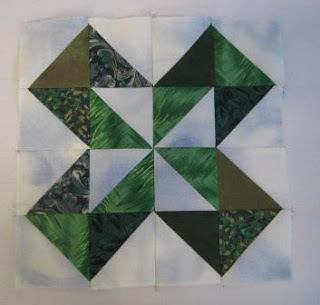 You can see the green fabric at the top left, it is required that we use a piece of the green in our block. Also in the box is a small book to write any notes about our blocks. The fan block has the template in the book. At the end of six month we will draw names and win one of the boxes that we worked on. Then there is a challenge to complete a wall quilt using our new blocks. Happy Quilt Bee Day, or Tuesday. Oooo.....LOVELY fabrics!!! Isn't that the most ADORABLE block????? Nice blocks - sounds like a fun exchange! Love your green block. So glad you were able to make it from scraps. Those are the best kind of blocks.